SRAM, the American groupset manufacturer, has unveiled a new single ring groupset system, which it’s calling 1x Road. The 1x Road system (pronounced ‘one-by’) is essentially an expansion of two of its original groupsets, the second tier Force and third tier Rival, and so now offers a single ring setup option for both, with either mechanical or hydraulic disc braking. The Force 1 option replaces last year’s successful CX1, cyclocross specific groupset, and now, with a large expansion of ratios, will cover a vast range of riding styles from criterium racing to adventure touring. The Rival 1 option is all-new however, and offers many of the benefits at a more competitive price. The single ring philosophy has evolved over the years since its inception into SRAM’s mountain bike groupsets, but essentially the idea remains the same. Replace either a double or triple front chainset and derailleur with a single ring. The result? Less maintenance, less weight, and a single lever to control shifting through all gears. The fact that this replaces SRAM’s CX1 groupset at first makes it seem like a small deal; an evolution. But in SRAM’s eyes it holds the potential to be something of a revolution in cycling because of the large range of possibilities it holds. 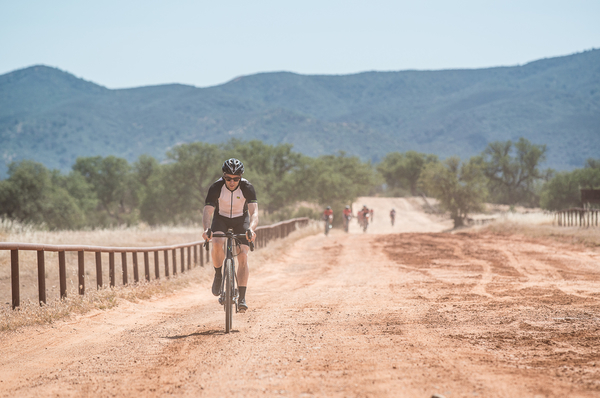 The fact that it can be applied to both gravel riding and time trials shows the diversity on offer, but really, the positive attributes remain the same in each scenario. A quick run through the list of potential benefactors of SRAM’s 1x Road system may give you an idea to whether it’s something you should look in to. To start with, the disciplines of Gravel and Adventure riding hold perhaps the most obvious benefits. With riding that tends to be hard wearing on a groupset, the 1x Road’s previous off-road experience brings with it some particularly suitable positives. The rear derailleur, on both Rival and Force options includes SRAM’s own ‘X-Horizon’ technology, which more-or-less reduces chain slap completely. A great benefit for bumpy off-road riding. At the same time, a new 42 tooth rear sprocket will open up a vast range of terrain possibilities, from rolling hills to full on gravel mountains. The categories SRAM are labelling 1x Tri (more applicable as TT for us) and 1x Crit are the most surprising and interesting options. With reduced weight, simple one handed shifting, and no realistic chance of dropping the chain at the front – thanks to their ‘X-Sync’ chainring tech that holds the chain in place – the idea of single ring racing becomes a real possibility. The tricky bit could be choosing the correct ratios for your ride, but we’ll come back to that later. 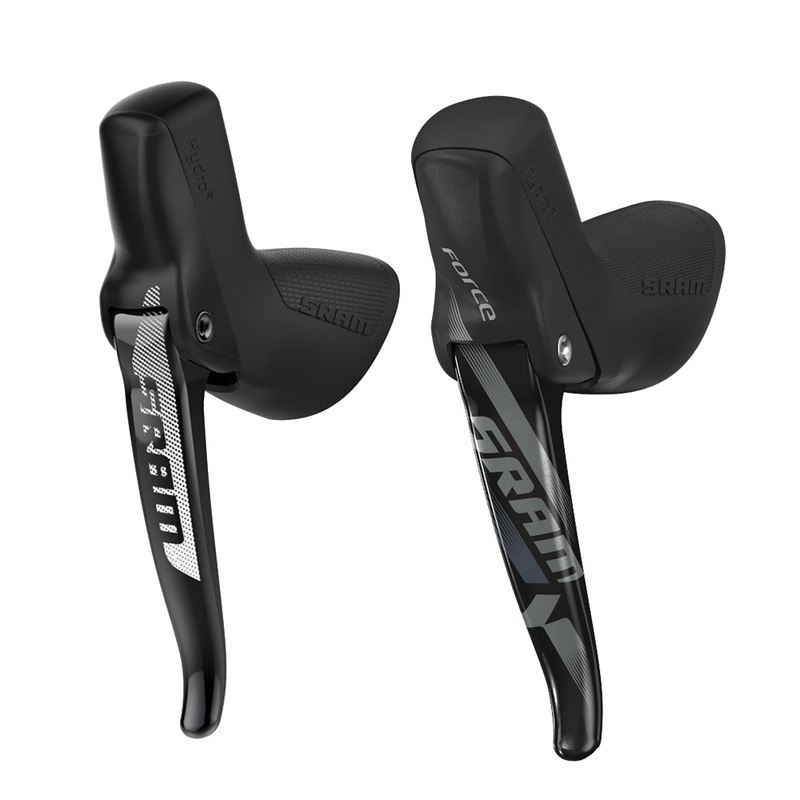 The final 1x Fitness category isn’t something to consider for most road bike duties, but with SRAM’s new S350-1 crank and S700 trigger shifter, for flat bar riding, it is something we’re likely to see appearing on more hybrid bikes in your local bike shop. The new 1x Road is really just an expansion of last year’s successful CX1 groupset, but that doesn’t mean you’re restricted to cyclocross ratios. For the SRAM Force groupset, chainring sizes include the previously available 38, 40, 42, 44 and 46 (all which come with extra cyclocross friendly mud shedding capabilities), and now grow to include a road friendly 48, 50, 52 and 54. For Rival, the largest size is a 50. At the back, cassette sizes are fairly similar to those available on other high end SRAM groupsets, like Red and Force, and so include 11-25, 11-26, 11- 28, 11-32 and 11-36. An even larger 11-42 is also soon to be available, which answers most questions as to whether a single chainring can realistically offer a wide enough spread of gears. Choosing which chainring and cassette option you’ll need might be the trickiest part about switching to a single ring setup. After all, chainrings aren’t cheap. Starting at £66 for Force, it’s costly if you chose a 52 chain ring for a crit racing setup, but then decide it isn’t quite right. On the other hand, checking a reference website, like the one offered by Sheldon Brown will help narrow down the options. As a starting point, it’s worth noting that a 39×26 is on par with a 54×36 (that’s a single ring 54 with an 11-36 at the rear), and so will offer the same range of gears as a traditional racing double. There are downsides. After finally reaching the smooth shifting of 11-speeds, SRAM are now taking away the tiny transition between ratios on cassettes, by offering us a much larger spread of gears. It won’t be to every persons tastes. For that reason, even though the gears offer the same range as a traditional racing double, you won’t see riders at this year’s Tour de France using a single chainring. Who will want a 1x Road groupset? As before, anyone racing cylcocross will still love the groupset. Adventure riders, who want a reliable and simplified groupset for off-road riding, and perhaps lighter weight touring, will appreciate the benefits too. Riders looking to save some weight would do well to look around the specific details, because SRAM claim the average weight saving sits somewhere between 150 and 200 grams. Those new to cycling may find the single lever shifting an attraction, and those who just don’t like maintenance will also be pleased, because there’s little to worry about around the chainset area anymore. Who won’t want 1x Road? Racers looking for super smooth ratios will still be better off with a standard 2×11 groupset, as will TT riders who tackle hillier courses. Those who require lots and lots of gears, like heavyweight tourers, will lose out by switching to a 1×11 system. Finally, everyday road riders who are quite happy with a double or triple chainset and front derailleur system won’t necessarily gain a huge amount from the system unless they’re looking for any of the specific benefits. SRAM aren’t claiming to be replacing 2×11 systems, after all they’re still peddling them. What are the big differences between SRAM Force and Rival 1x options? Weight and price are the main differences, with Rival being heavier and cheaper. SRAM Force uses some more luxurious materials such as carbon fibre to achieve a lower weight, and that costs more money. Force comes with the two largest (52 and 54) chainring sizes, which aren’t available on Rival, and won’t fit on a Rival’s 110BCD crank either. Force’s smaller chainrings, which were available on last years CX1, are shaped to shed mud more effectively than Rival’s too, so either way, if you’re going racing, Force is the better option. Can I use pieces of this package, combined with my own parts, to create a cheaper single ring option? Technically yes, but which ever part you don’t buy, you’ll be losing out on a certain feature elsewhere. For example, by purchasing the fancy clutch rear derailleur but no chainset, you’ll lose out on the X-Sync tech which holds the chain on at the front. If you don’t buy the rear mech, you’ll still have chain slap, which could lead to chain drop at the front. You could fit a SRAM chainring to your own crank, if the measurements match up, but it won’t sit in the right place unless it’s fit to a SRAM crank, and so won’t run as smoothly. Summer 2015. 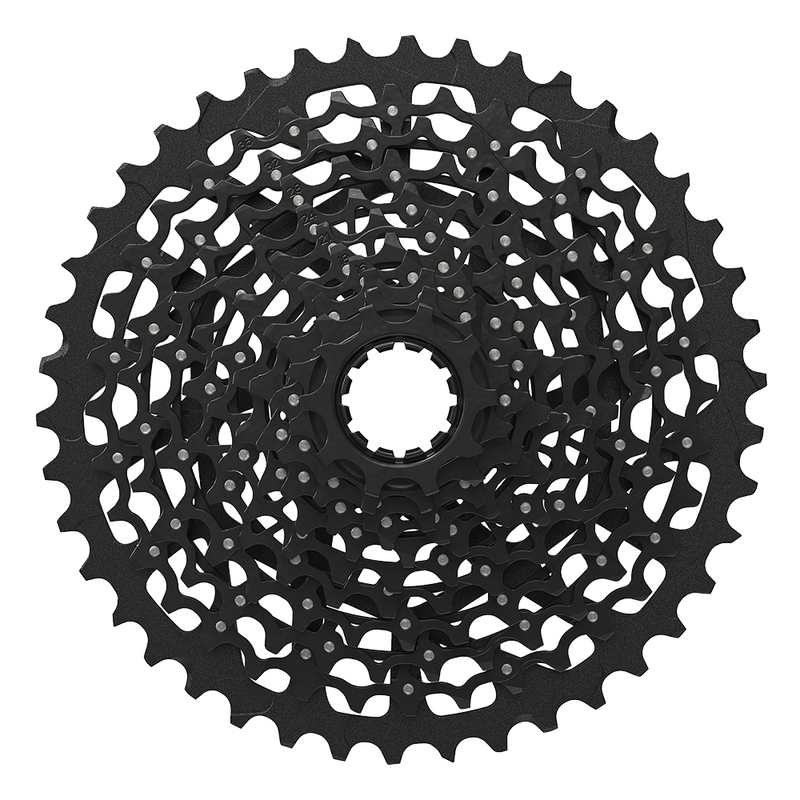 Some Rival parts arrive in June, but road chainrings and cranks will be here in July, followed by the entry level PG1130 11-36 cassette in August. Yes, on a three hour road and gravel ride. We had a good chance to get to know the 1x Force groupset while sat aboard a Salsa Warbird aluminium frameset and Zipp’s new 30 Course wheelset. We liked it a lot. Smooth shifting and a quiet ride thanks to the lack of chain slap on bumpy descents. We’ll be playing with the TT and Crit ratios before commenting further though.